From the Baldwin County Courthouse, go west on Hancock Street for 2 blocks or 0.2 mile (or the one large block containing Georgia College & State Univ.). Turn right on Clarke Street. Go one large block or 0.2 mile. Turn left onto Highway No. 22 (west) or Montgomery St. Go 5.0 miles. Turn right on Old Monticello Rd. Go 1.4 miles on Old Monticello Rd. Turn left on Watson Rd. Go 0.4 mile. House and cemetery are on left. Cemetery is 200 feet to the right rear of the house. 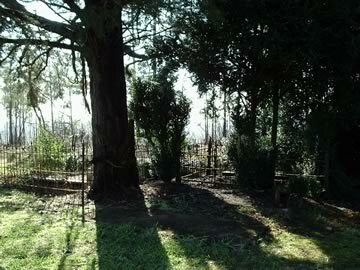 Big cedar trees and boxwood nearby. Iron fences around some of the graves. Cemetery was started by the Turk family. In 1889, the land was sold to the Watson family. The cemetery includes both families. Identity per Virginia Watson Brown. Unmarked Child Slab - Robert Malcolm Watson, Jr.